Good quiet rooms very secure. Very good as per last time. Staff excellent. Note eggs were cold when I had 6.35am breakfast on 16/5. Would love a choice of a nice hard pillow instead of all 4 soft. Excellent except for NOISY night time arrivals. excellent value for money place to stay. Secure car parking a big bonus. All meals available any time if needed. All staff were very helpful!! I stayed while my husband was in hospital nearby. staff were exceptional. Nothing was too much trouble. comfortable room very clean. I would certainly stay again. Staff was very friendly, organized, and helpful. Car parking was available on site for no extra cost! Rooms were good and clean and have everything you need. Always friendly staff when we stay. Location is great. Great except that air conditioning did not work consistently in the room. Had to call front desk to set air conditioning. After being set by front desk, air conditioning stopped working around midnight resulting in a room too warm to sleep comfortably. Fine, nothing exceptional. Carpets are very tired down the stair wells, in fact a disgrace and should be attended to. 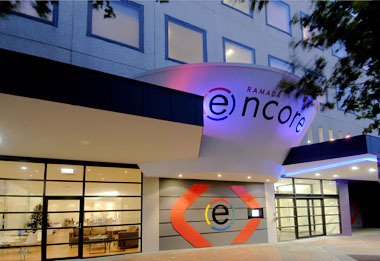 We being staying at the Ramada Encore Dandenong every year. Good location, accommodation, service and value for money. The shower glass is to short & needs to be extended as water goes all over the bathroom tiles. More attention needed to check broken hooks & carpets on stairs very worn & should be replaced. For my business travels to Dandenong I find the Ramada a very pleasant and quiet place to stay that is comfortable and where I can have a nice meal in house if I choose. I also like being able to park my car securely. Staff are also friendly and the Ramada is easy to access by vehicle. What a little gem. Ideal location for our nearby Kokoda Challenge - Melbourne walk. The staff were excellent and could have been more helpful. The breakfast as part of the package was fresh and plentiful. We have travelled extensively and this hotel, service, staff and the breakfast are right up there among the best. Room is clean and staff is friendly. Breakfast is excellent. All good except that the bed is a bit small. This is a recommended stay for business travellers in Dandenong - great staff, great food and good clean accommodation all for excellent value. Handy parking to boot ! What more would you want ? Very enjoyable. Had great time watching football with dinner and beers in the cafe. Staff very attentive. We love staying at the Ramada. It's convenient to the local amenities. Really easy to get luggage from car park into the room and great value for money. The reception, chef and cleaning staff were all friendly and helpful. Very nice, suited me well. Staff were really good to deal with. We have stayed at Encore many times but never before on the 3rd (top) floor. The room was very noisy and thought it was our A/C but when we shut it off late evening the noise remained the same. Contacted staff who tried to solve the problem but when they couldn't they shifted us without delay or fuss to another quieter room on the second floor. Our thanks to the staff for the fast service. In the end a good nights sleep was had. Apart from a bit more attention to detail the stay was very good indeed. The heating in the room could be better but we could have asked for assistance but chose not to. It is centrally located and shopping is very handy. The staff is friendly and are flexible with check in and out time.